When audiences pack the auditorium this weekend for “Newsies” — Staples Players’ eye-popping production of the Tony Award-winning show — they’ll rave about the Broadway-quality singing and dancing. They’ll give standing ovations for the high-energy pit orchestra. They’ll congratulate directors David Roth and Kerry Long as one of the first high schools in the country to pioneer the musical. They’ll notice the set, too. But unless they’re intimately involved in theater, they won’t understand how much the scaffolding, backdrops — and over 1,500 newspaper bundles — contribute to “Newsies”‘ success. Reid Thompson knows. 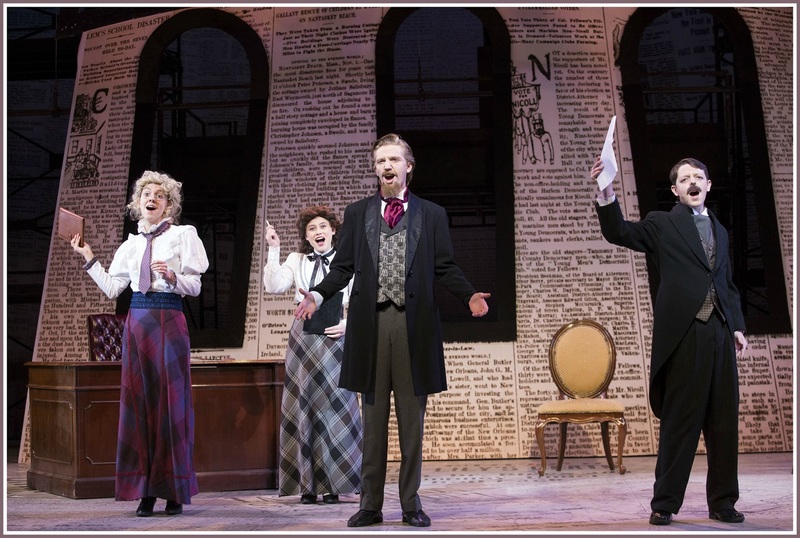 He’s the Players grad — and professional set designer — who helped bring the New York newsboy strike of 1899 to life in 2017 Westport. As a student in the mid-1990s, Staples’ art wing was Thompson’s refuge. Legendary tech director Joe Ziegahn asked the budding artist to paint horses for “Carousel.” The rest is theatrical history. He trained at the Art Institute of Chicago. After graduation, Roth and Long asked him to work on summer musical sets at Danbury’s Richter Park. That led to work with Players shows like “Into the Woods,” “Merrily We Roll Along” and “Hello, Dolly!” At the same time, Thompson painted Broadway and off-Broadway productions, including “The Lion King,” “42nd Street” and “Priscilla, Queen of the Desert.” A 5-year stint painting for the Metropolitan Opera House followed. 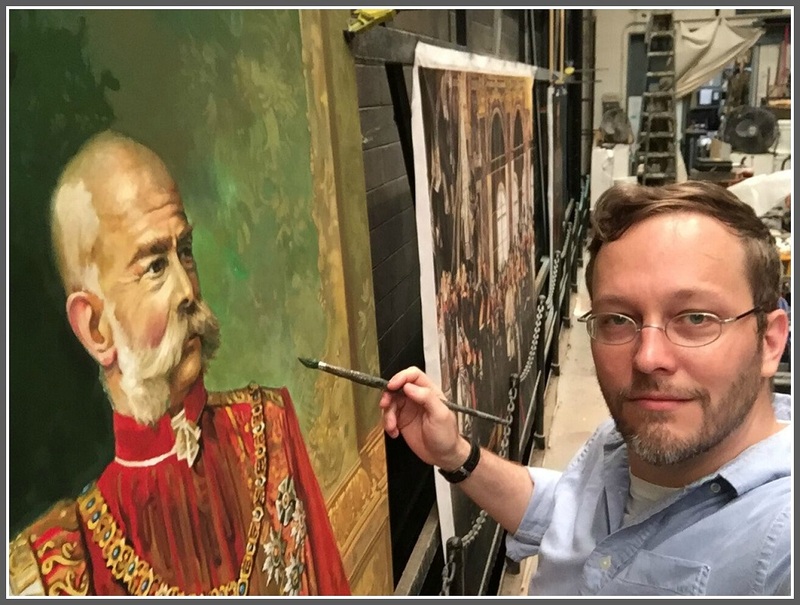 Reid Thompson painting “Der Rosenkavilier” at the Metropolitan Opera. But Thompson wanted to learn more about set design, so he applied to Yale School of Drama. His Staples portfolio helped gain admission to that very competitive institute. Working there with directors, actors, stage managers and techies, he forged bonds that brought him important New York work (“The King and I,” “Fiddler on the Roof”). Beginning last summer, Thompson and the directors talked about period, context and themes. They researched the history of the newsboy strike, its importance to the labor movement and protections for children. They talked about characters. Thompson looked at historical photos and artwork. Newspaper collages struck a particular chord. Staples’ huge casts need space to move and jump. Scenery must provide a setting, but flow seamlessly during transitions so audiences are transported into the sweep of the story. There are other challenges. Can everyone in the audience see the action? Can the singers see the conductor, and vice versa? And of course, what’s the budget? Thompson set to work using a scale model. He focused on a collage of period newsprint that evokes turn-of-last-century New York: vertical, a bit grimy, sensationalistic. Scaffolding represents tall buildings, and period ironwork. “Newsies” is a show about kids. Thompson wanted audiences to see their perspective. Thus, much of the set looks upward — “large and overwhelming,” the designer says. The newsies’ world was black-and-white — literally and metaphorically. Much of the set is too. But when Jack Kelly, the lead character, is in the vaudeville theater, he feels safe. Thompson added vivid colors there. The stage manager and lighting designer worked from Thompson’s ground plan and drawings. Technical director Pete DiFranco and student carpenters built sets based on Thompson’s construction drawings. Steelwork was done in a professional shop. Thompson created the collages himself, using period newsprint sent to a digital printer in Brooklyn. 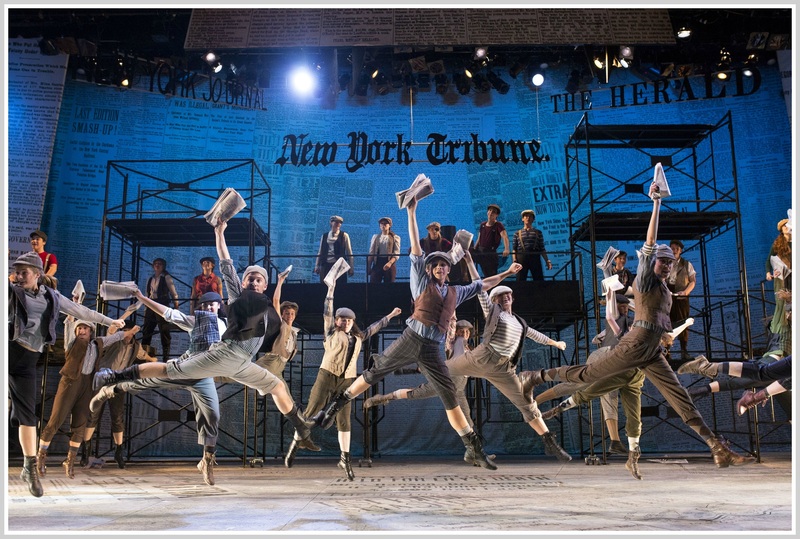 Conceptualizing — then realizing — a show like “Newsies” takes enormous work. Thompson likens it to an architect working with clients and contractors to produce a building. When we look at buildings, most of us don’t think of the people who designed it. The same with theater sets. Even audience members who admire the design and detail don’t always realize how, say, moving pieces of scenery on and off stage contributes to the flow of the show. Or that the designer pored over hundreds of photos before creating a certain scaffold, then positioned it just so. “Newsies” has earned a place as one of Players’ most storied productions ever. It will be talked about for years. Audiences will remember the singing, the dancing and the acting. They may not recall Reid Thompson’s sets. But without them, this remarkable show would not go on. It was the mid-1970s, and 19-year-old Lynn Muniz needed a summer job. The Trumbull native was studying to be an art teacher, but couldn’t find work. One day at the Westport Country Playhouse, she saw a group of young people painting sets. She joined them, spent the rest of the summer there — and got sucked into the theater world. Lynn did not become an art teacher. 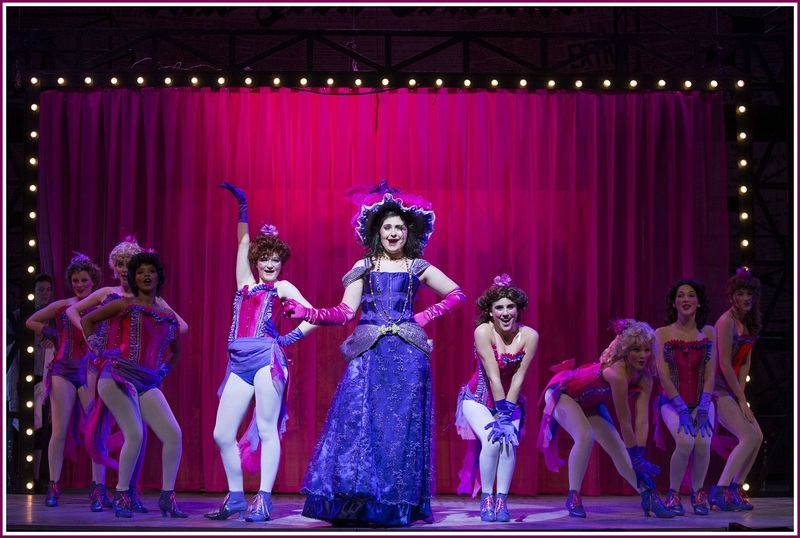 After graduating from Penn State with a degree in painting and a minor in theater, she went to Broadway. She’s been a set painter — officially, a “scenic artist” — ever since. “Amadeus,” “Starlight Express,” “Lion King,” “Hairspray,” “Hair,” “West Side Story” — Lynn worked on them all. She also worked on feature films like “Confessions of a Shopaholic” and “Promises! Promises!” And she’s painted sets at the Metropolitan Opera. A couple of years ago Lynn told a colleague she hoped to get that long-forgotten teaching certificate. She wanted to work in a public school. 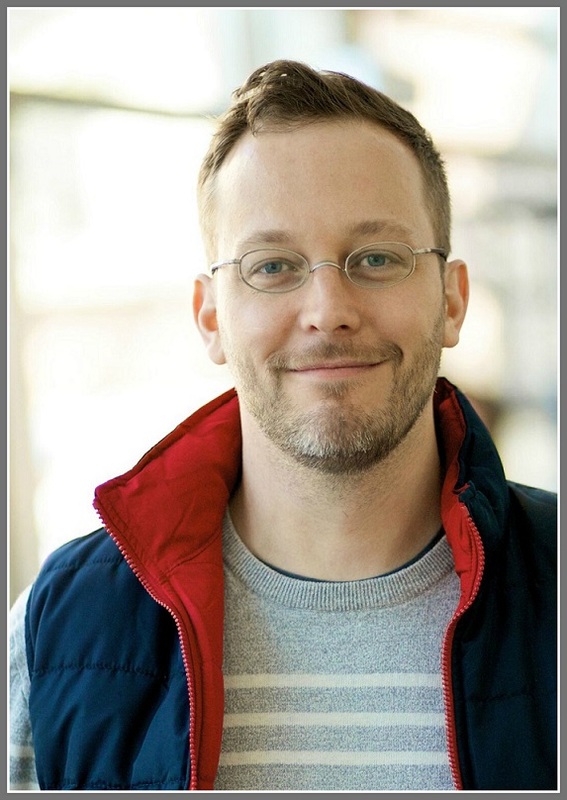 The friend was Reid Thompson — scenic designer for Staples Players shows like “Guys and Dolls” and “Twelve Angry Men.” He hooked her up with Players director David Roth, and associate director Kerry Long. Two years ago, they asked Lynn to run a painting workshop for “Romeo and Juliet.” She had fun; the tech crew did too. A new partnership was born. Lynn’s move from Broadway scenic artist to public school art teacher has been inspired, in part, by the Staples students.